Backed by a team of creative designs and skilled tailors, we have been able to put forth for our clients a durable and comfortable range of Nylon Halters. Under the strict supervision of our expert professionals, these halters are designed and manufactured using only qualitative leather and advanced machines. Made as per the standard size in distinctive designs, colors and sizes, these can also be customized as per the requirement of the client. 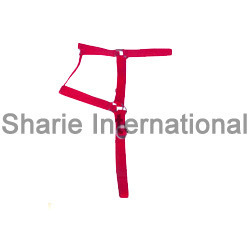 Nylon Draft Halter offeredcome in aesthetically designed finish and can be provided with horse ribbon as well as in size options of Full, Cob, Pony. With multiple color options to pick from, these draft halter options are perfectly scaled and comes constructed using durable double ply Nylon as well as nickel plated hardware for lasting service usage. 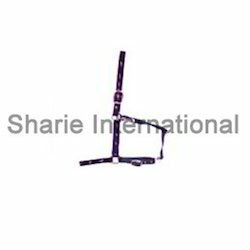 Some of its features include fixed cavesson with adjustable crown; perfect for all daily riding activities & trail riding; adjustable at the throatlatch, nose and both crown side areas; reins can be delivered with options of English-buckle in center/Western-split in center. 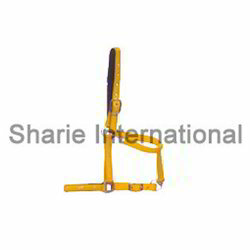 Nylon Horse Halter offeredcome in quality construction finish and can be made available in an array of choices to pick from. These Nylon halters come with Nuback pad, fashionable ribbon, iron hardware support in size options of Full, Cob, Pony as well as in multiple color choices. 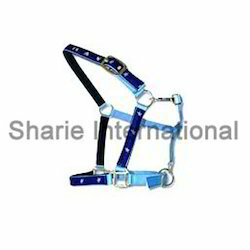 Some of its features include halter with rolled throat, snap and adjustable chin; superior strength finish; quality nylon halter available in different colors; adjustable to customize particular horses fit; rolled throat latch; brass plated rings; sizes of average or large. Brown Nylon Halter offeredcomprise nylon halter with horse ribbon fashion and can be made available in size options of full, cob, pony. 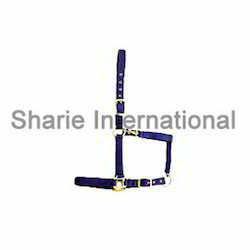 Made available in different color options, these provide usage as comfortable stable halter and come with double ply nylon web with heavy duty brass hardware for durable finish support. 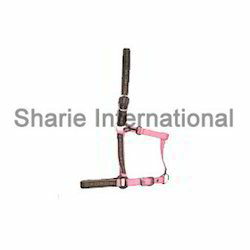 Some of its features include fully padded for optimum comfort; supporting elimination of skin rubbing possibility; adjustment support provided at crown and nosebands; different colors like black, red, green, purple; size options including cob, full size or oversize; leather breakaway tab between cheek and crown. 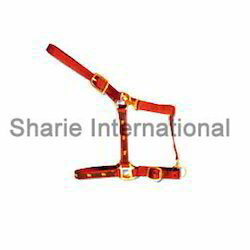 Adjustable Nylon Halter offeredcome in quality construction finish and provide for economical usage. 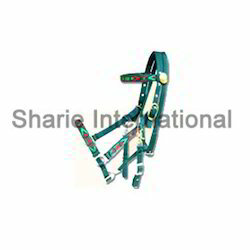 These halters come with ring fitting support as well as in options of adjustable buckle in sizes of Full, Cob, Pony as well as in different color options to pick from like white, gray, hunter green, navy, burgundy, royal blue and others. Some of its features include can be custom made as per the requirements of customers; providing for perfect usage support; offers longer service life. Looking for Nylon Halters ?